We stayed at the Barracuda it was very clean the staff was very sociable and friendly, I will say the food could have been a little bit better as some meals it was not very warm although they have a microwave. The other complaint I have is that they put us on the roadside of the hotel which does not get any sun at all, we did ask how much it would cost to move (what a shock!) 240 euros that would have been for 3 weeks which we could not afford anyway, but after all that we did enjoy our holiday, the beach is the cleanest we have ever seen, I would give it 10 out of 10. This is a very brief report as further information will be found on an extended report in the Costa Del Sol forum. The hotel was spotlessly clean, the room was cleaned and towels changed daily. Food choices were a little too English for me and potato choices were often limited to chips. However, everything that was served was very well cooked and prepared and at the end of the day we didn't pay a lot for a weeks half board. 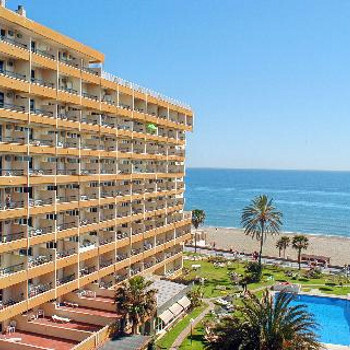 The Hotel is in the quieter end of Torremolinos/Carihuela but is right on the beach. It has extensive grounds and its own pool and is very close to Benalmadena. We walked into Benalmadena on a number of evenings after we had eaten and found there was plenty of activity both around the harbour and towards the main road. The Flamenco evening on friday was very good - most of the rest of the week the entertainment was limited to a mediocre guitar/singer or keyboard/singer. But we tended to go elsewhere and just return to the hotel for a final drink. Would we go back? Most definitely! Would we recommend it to friends? again Most definitely - I think a telling sign was that every weekend there was an influx of Spanish guests. If it is good enough for the spanish it is good enough for me. But be quick. There is a notice on the outside about forthcoming renovations and regrading and I think it is aiming for 4 star status which will mean higher cost!! The rooms were cleaned every day, including the day I was confined to bed with a hangover! At 6.30 pm reception phoned and asked if the maid could come up. As I was limping down for dinner this was ok with me. Fresh sheets made me feel so much better on my return! There were a large variety of meals - from salads to salmon. I am very picky eater and was reduced to chips & mayo only twice. The breakfasts were great and the girls loved the chocolate croissants in particular. We could quite happily have only eaten at the hotel but did take in some ok Chinese meals and fabulous baguettes around and about. I could have hired a fridge from a local company but decided against it. There was no need as everything was reasonably priced so it was not hardship to nip out & buy.